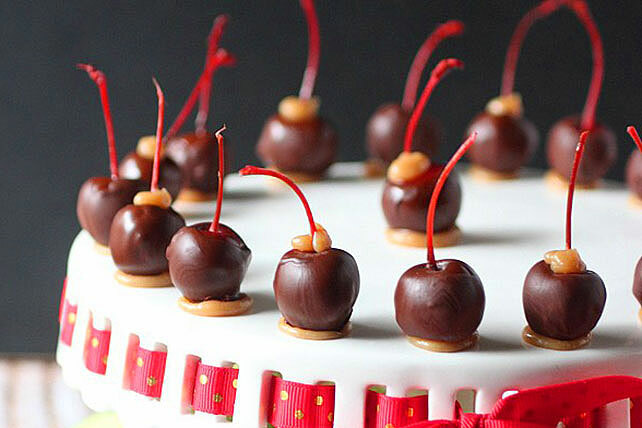 Learn how to politely double dip by making these Double Dipped Chocolate Caramel Cherries. Bite into juicy cherries covered in chocolate and then caramel! Line a cookie sheet or jelly roll pan with parchment paper and place in the freezer. Place washed and dried maraschino cherries in a medium bowl and set aside. In a medium stainless steel bowl placed over a small pot of simmering water, melt the chocolate and coconut oil until melted and completely smooth. Remove bowl from heat and allow the mixture to cool for 3-5 minutes. Remove parchment lined cookie sheet from the freezer and set on your work surface. Hold a maraschino cherry by the stem and dip, submerging cherry completely into the melted chocolate mixture. Lift the cherry from the melted chocolate and allow the excess to drain completely back into the bowl. Place the cherry on the cold parchment lined cookie sheet. Repeat with remaining maraschino cherries. Place the cookie sheet in the freezer until the chocolate has set, about 7-10 minutes. While chocolate sets, make the caramel mixture. Melt the caramel: In a medium saucepan over low heat, melt the caramels. Once melted, add heavy cream and vanilla extract. Mix until combined. Allow the mixture to cool slightly and then transfer to a piping bag fitted with a small round tip. Alternatively, you can transfer the mixture to a zip sandwich bag, cutting a small hole in one corner. Remove cherries from the freezer. Hold a maraschino cherry by the stem and dip, submerging cherry completely into the melted chocolate mixture. Lift the cherry from the melted chocolate and allow the excess to drain completely back into the bowl. Place the cherry on the parchment lined cookie sheet. Repeat with remaining maraschino cherries. Place the cherries on the parchment lined cookie sheet and place back in the freezer to set, another 7-10 minutes. Once the chocolate has set, to secure the cherries on to a serving platter, pipe a dab of caramel to the plate then place the cherry on top. Then pipe mounds of caramel right above the stems of every other cherry. Instead of placing the cherries in the freezer for the chocolate to set, leave them at room temperature. This process will take a little longer, at least 15-20 minutes longer depending on the temperature in your kitchen. The cherries are ready when they lose their shine and are not sticky or tacky to the touch. Substitute fresh cherries or spring for fancy maraschino cherries! Substitute small strawberries or even raspberries.